(CNN) -- The challenges inherent in getting a 162,000-pound aircraft off the ground and landing it safely are pretty obvious to most observers. 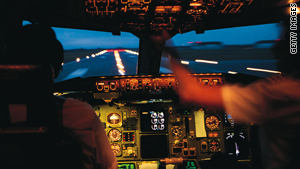 But at cruising altitude, above 10,000 feet, pilots face a different critical challenge: staying focused. Two Northwest Airlines pilots lost their licenses Tuesday after they missed their destination by 150 miles because they weren't paying attention to their instruments or air traffic controllers. No one was hurt in the incident last week, but the Federal Aviation Administration called Capt. Timothy B. Cheney and first officer Richard I. Cole "extremely reckless" and said they put the public in danger. When cruising over great distances, "it's very easy to be distracted because there's not a whole lot going on," said Emilio Corsetti III, a 30-year commercial pilot with American Airlines who has written numerous magazine articles about aviation. An airliner's entire flight can be programmed; once that program is activated, "the plane will fly to its destination without any input from the pilot at all," he said. Cheney and Cole told investigators they lost track of time while using their personal laptop computers to look at new airline scheduling software related to Northwest's merger with Delta Air Lines. They were piloting the Airbus A320 from San Diego, California, to Minneapolis, Minnesota, a flight that should take 3 hours and 42 minutes. So how do pilots pass the time and stay focused if they're not actively controlling the plane? "Sometimes you have to be creative to keep your mind occupied, but you're getting paid to monitor the radio and the instruments on the cockpit, so that's what you've got to do. That's all there is to it," said Charlie Bray, who retired in 2004 after 25 years of flying planes for Delta Air Lines. On Delta, pilots are not allowed to read anything that is not related to the operation of the aircraft, Bray said. "You can't read a novel, but you could read a manual about procedures or about the airplane," the former Boeing 767-400 pilot said. "You can't read a newspaper. You can't use a laptop. That's strictly prohibited." However, some airlines make documents, including manuals, available only in digital form and provide company laptops for pilots to use, Corsetti said. "It's not that unusual for a pilot to be looking at a laptop in cruise flight," said Corsetti, who is rated to fly the A320. The A320 is controlled with a side stick rather than a yoke, he said. The pilot can pull out a tray-table, which is probably where Cheney and Cole had their laptops, blocking their view of some of their instruments, he said. If the plane was on a flight program, it would have made turns automatically and messages would have flashed on the pilots' display to let them know it was time to carry out landing procedures, Corsetti said. If it was not programmed but merely homing in on the Minneapolis-St. Paul airport, the plane would just keep going on the same setting after passing over the destination, he said. It's just not reasonable to expect a pilot to keep his eyes fixed on his gauges at all times, especially on a flight of more than three hours, said Corsetti, author of the book "35 Miles From Shore," about the 1970 open-water ditching of an Overseas National Airways flight. "To be honest, if all you did was sat there and looked at the instruments for hour after hour with nothing changing, you're going to be less focused," he said. "You're just going to kind of drift off because there's nothing to stimulate your mind. ... Any human being would lose interest in that function very quickly." As long as the plane is above 10,000 feet, the pilots are free to chat about any subject, Bray said. "If you happen to be flying with a crew member you have a lot in common with, you spend a lot of time talking," he said. "When you're at cruise altitude, visiting, talking, that's perfectly normal. And you can monitor instruments and listen to radios while you're doing that." Still, Bray said he always tried to keep the cockpit conversation under control. "The captain sets the tone, and my professional procedure was I always ran my cockpit by the book. It's easier to go by the book because that's the safest way, and you're never going to get in any trouble doing that." The Northwest incident has brought calls for the Federal Aviation Administration to impose tighter regulations on behavior in the cockpit. It's the latest in a series of accidents and incidents related to pilot inattention or distraction. The pilots of a Colgan Air flight were idly chatting even as their plane descended below 10,000 feet near Buffalo, New York, in February, a National Transportation Safety Board investigation found. That plane crashed, killing the two pilots and 48 other people. Other factors, including icing and poor training, also appeared to play a role, the NTSB said. Two Comair pilots were talking about their families and schedules just before their jet crashed while attempting to take off on the wrong runway in Lexington, Kentucky, in 2006, a transcript of cockpit conversations showed. And NTSB investigators believe an inattentive crew ignored warning signals before the 2002 charter plane crash that killed Minnesota Sen. Paul Wellstone and seven other people. While acknowledging the Northwest pilots made "an inexcusable mistake" last week, Corsetti said part of the solution to pilots' distraction is to loosen the rules, not tighten them. "If you're in cruise flight, a crew should be able to do anything they need to do to stay alert," he said. "The flight is automated. If there's a malfunction, the crew will be alerted. "The question is how do you stay alert? You can't look outside for stimulation. You can't listen to the radio for stimulation. So what are your options?"